Maple Leafs centre Auston Matthews, who signed a five-year, $58.17 million US contract extension on Tuesday, is excited at the possibility of winning a Stanley Cup in Toronto. "This city deserves it. I love playing here. The support we get day in, day out ... it's nuts." 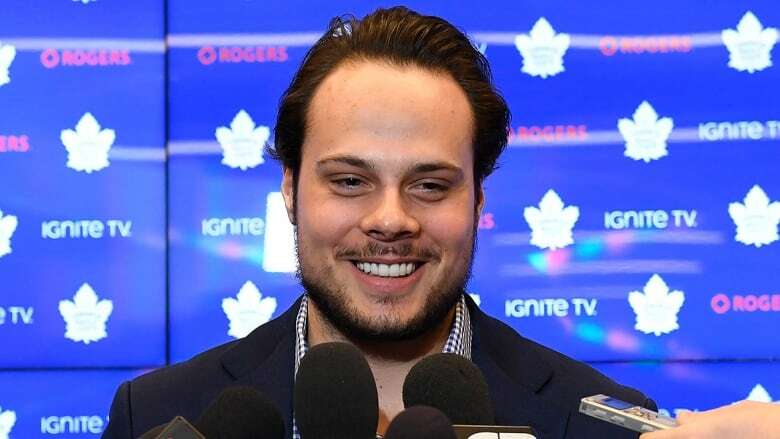 Auston Matthews uttered the word "special" eight times in his first discussion with reporters after signing a five-year contract extension with the Toronto Maple Leafs on Tuesday. The 21-year-old star centre talked of it being a special day for him and his family, and how special it is to play in a hockey-mad city like Toronto for a special team and teammates. "I think we'll always feel the pressure from fans here, but they want a championship team and we want to give it to them. This city deserves it," said Matthews, whose deal carries an average annual value of $11.634 million US. However, he will receive most of it in signing bonuses. Auston Matthews year by year breakdown:<br><br>Year 1: $15.2M SB, $700K salary.<br><br>Year 2: $15.2M SB, $700K salary.<br><br>Year 3: $9.7M SB, $750K salary.<br><br>Year 4: $7.2M SB, $750K salary.<br><br>Year 5: $7.2M SB, $750K salary.<br><br>That’s $54.5M in SB, $3.65M in salary. "We've got a special team, a lot of talented players. We're doing everything to get to that ultimate goal [of winning the Stanley Cup] and we work every day to accomplish that." Matthews, who was eligible to become a restricted free agent on July 1, said his representatives and Maple Leafs general manager Kyle Dubas discussed a contract that ranged from three to eight years and noted an agreement wasn't a must during the season. "I love playing here, I love the city, my teammates, management, the whole staff from the top to bottom," Matthews said. "I don't think there's anything like playing in this city. From our fans, the support we get day in, day out, walking down the street getting recognized, I mean, it's nuts. It's not something I really imagined as a kid growing up in Arizona to play in a market like this. "It's definitely something I don't take for granted and I don't think anybody on the team takes for granted." Matthews is fourth in scoring on the team with 46 points on 23 goals and 23 assists, but has played only 38 of Toronto's 52 regular-season games because of injury. Since Matthews was drafted first overall in 2016, only Alex Ovechkin has scored more goals per game among players who have played at least 50 games. "We made the investment in Auston because he's shown tremendous potential," Dubas said. "He's a centre and he scores at an elite rate that few have matched in his first three years in [the NHL]. We know what he's capable of and he's still a very young man. He has a lot of potential that we have to help him to reach." Matthews's three-year rookie deal called for him to make the maximum $925,000 a year. The native of Scottsdale, Ariz., has 97 goals and 81 assists in 182 regular-season games. "I'm proud to be a Maple Leaf today and for the foreseeable future," Matthews said. With winger William Nylander having signed a new six-year deal in December worth $10.2 million this season and $6.9 million the following seasons, that leaves stylish winger Mitch Marner on Dubas' to-do list. Contract talks with Marner, however, have been put on hold until after the season at the request of his agent, Darren Ferris of DHG Sports Agency. "Mitch is a wonderful young player. He's someone who loves hockey every day and comes in with great energy and enthusiasm. He's going to be a Toronto Maple Leaf for a long time." Marner, 21, leads the Leafs in scoring this season with 63 points (20 goals and 43 assists). Veteran centre John Tavares is second with 56 points (31-25) and defenceman Morgan Rielly is third with 52 (13-39). Tavares signed a seven-year, $77-million deal with Toronto as a free agent last July. In addition to Marner, Toronto has some more loose ends. Forwards Kasperi Kapanen and Andreas Johnsson are eligible to become restricted free agents while defenceman Jake Gardiner is headed towards unrestricted free agency. Toronto hosts the Ottawa Senators on Wednesday.